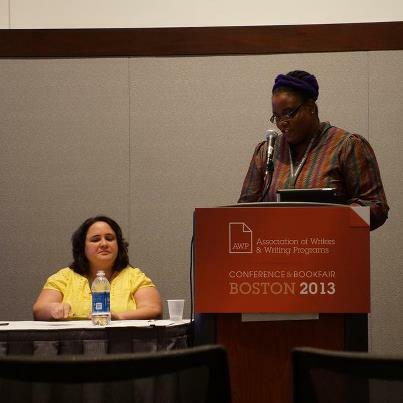 Elizabeth Stelling, poet and editor of Zombie Poetry ezine, attended the annual Association of Writer and Writing Programs conference in Boston this spring. Below she gives us an inside view of the experience and insight regarding the reason for it’s existence and what can be gained by attending. This is a must read for anyone who may be contemplating attending any writing conference. This past week I had the opportunity to attend my first writing conference. A bit intimidated by the title AWP- Association of Writers and Writing Programs, because I am myself a late bloomer writer, having gone to college for career opportunities other than a MFA program (Masters In Fine Arts degree). But bustling through this town for four days it could have been daunting for me; it wasn’t hard to spot the many AWP canvas loot bags given out at registration on almost every street traveled to and from the Hynes Convention Center residing off Boylston. The sheer site of crowds roaming every crevice relayed the size alone by Thursday morning. Yes, Thursday night in the auditorium the president of AWP said over 12,000 writers descended onto Boston March 6-9th, 2013. The food community was ready. Printed signs adorned doorways as you entered as well as throughout the city. My friends and I were glad they didn’t run out of food because a snow storm hit Wednesday. By then it was slushy tromps around the convention area to feed your weary body before and after attending the offerings, but well worth my icy water filled shoe mishap on several occasions. Of course hailing from the hotter southwest area of Texas, I did not pack boots. There will be a next time. During the first afternoon of registration sign-in I heard table conversations about how the year before in Chicago it was sold out and they were not prepared for the growth but it looked as though this time they did a better job of creating a more space friendly environment. The place was huge; three stories of conference rooms, book fair halls, and an auditorium large enough to hold keynote speakers Seamus Heaney and Darrek Walcott, to name a few. As a poet myself, I anticipated these two poets combatting in friendly fire as keynote moderator Rosanna Warren sat in between asking questions. Part of me wanted to linger on the accents (I did visit Ireland and saw Heaney in Dublin so many years ago). It was all I hoped for as I left with Heaney saying “linger in clammer” for good poetry writing, and Walcott’s sense of humor on Keats. One of my editor/poet writing readers for Z-composition attended with me. The night we arrived we compared notes on what was most important out of the many panel and reading offerings would we attend alone or together. We discussed among ourselves and others throughout the conference, that it was almost overwhelming. Some days had overlapping discussion we would have liked attending, other days were so so. Trekking up and down three floors and a few too many hallways with fifteen minutes to grab a snack or a restroom break could have been tiring if you did not pace yourself. I am not a spring chicken anymore, but I managed. However they were short on restrooms and seating along the way, and very long on lines due to attendee numbers. The lines hindered a few schedules, and once I found myself locked outside the room with armed guards. This goes back to the first morning when Athena and I attended an agreed upon session- Using Careless Speech for Careful Writing—The Art of Using Unplanned and Casual Language to Convey Style and Meaning. It featured a panel consisting of Todd James Pierce, Peter Elbow, Kimberly Lojewski, Tracy Daugherty, and included Jack Kerouac’s public stance introduction “First thought, best thought.” You learn his manuscripts reveal that he revised his prose to offer the illusion of spontaneity. We suspect the commentator was the sought after person for this class, because it wasn’t even standing room only, and the rest of the panel pretty much referenced his work. I won’t go into how annoying it was to have people stumble over your feet, or sit in front of you blocking your view; how they left the doors open, the only time we saw this the rest of the conference, and it invited many others to intrude on the already overcrowded room. Let’s just hope the space for next year’s event is more organized. The conference was a great place to network, buy your peers publications, and hear well published and polished authors such as Cornelius Eady, who is well known for the jazz and blues movement throughout his work. His literary band Rough Magic performed, and alongside him was writer Robin Messing belting out vocals behind Cornelius’s words. Their session still pops for me today. You could purchase his newest collection Book of Hooks, poetry and CD’s, and I did. I am glad I made the connection because it will inspire my own literary band- Red Dashboard with Flora Newberry. They have also consented to performing in my Summer WAMPP- Wine Art Music Poetry Project event in north Jersey. It does pay to fork out the funds to attend these events. In a heavy discussion with a group of writers over lunch I and a few others were encouraging the shyer ones by flashing our booty of business cards. “Don’t be afraid I said” and explained how I found seats at almost full tables and simply asked if I was welcome, most said yes and you just jump in and ask them, flattery always works, if they have a book. Like submitting our work, what is the worst one might say, no, but they won’t. Most are attending to learn, but from the size of the book fair, many are their promoting their works. We are essentially lonely introvert writers who need to feed our egos. But let’s not forget the learning aspect. One of my most memorable moments will be when I sat down and NY poet Hal Sirowitz sat across from me. We talked for over an hour and a poem was inspired. I have a feeling he and I made a real connection. At least I hope, because I could learn from his experience. Speaking of poets, many groups such as QVS- Organs of Vision and Speech Magazine out of New Hampshire and Queens College of Charlotte, NC and Sibling Rivalry Press out of Arkansas and many more conducted off site readings. It was a wonderful chance to listen to some of your favorite poets, and to find new found favorites. Hearing always brings writing to life; it allows one to visualize the voice written within the words on the page. There were also scheduled on site readings such as the WHIM Old School Indian Reading, featuring Monty Campbell, Jr., Barbara Mann, Paul Hapenny, Stephanie Elliott, Larry S Mann- most used their native American names. Meet the new Indian Movement: W.H.I.M. (Woodlands Horizon Indian Movement for the politically correct and Woodlands Hotties Indian Movement for those who can still laugh). 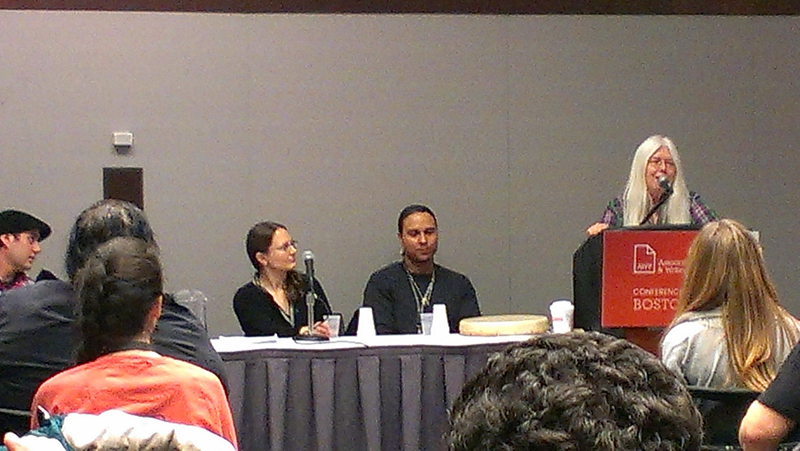 This multi-genre reading panel is comprised of Old School Woodlands Indians who read from their works and Larry Spotted Crow Mann performed the sacred drum song. He is a writer, performer, Nipmuck cultural educator and citizen of the Nipmuck tribe of Massachusetts. He serves as the Drum Keeper of the Tribe which is a sacred trust. I cannot describe how moving this noon time presentation was. Among a few others I have to mention- Stranger in a Strange Land? The Poet in the Composition Classroom, featuring Jessie Carty, D.S. Apfelbaum, Athena Dixon-DeMary, Tawnysha Greene, Stephanie Kartalopoulos. 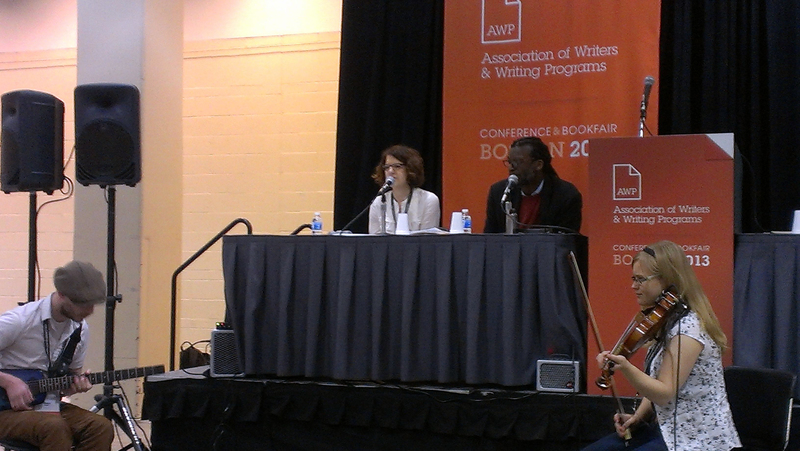 This panel consisted of poets involved with the teaching of composition, and how to bring poetry into this setting. There were international perspectives on love and language, African American panels- The Enduring Voice: African American Poets on Music and Musicians; highlighting and integrating musical icons and their works into writing and poetry, Essaying the Essay, How to use social media to your advantage, Small presses and big presses bringing tips on how to break into the world of writing, and I could go on. Next year at the 2014 AWP convention in Seattle, Washington you will find me sitting at a table in the book fair selling my publications, along with a few other author friends, or jetting up the escalator to a panel (you can submit proposals for future panels you feel would interest us), and discovering some yummy eats down or around the corner. I am a chef by trade, so food always ends up in my writing or in the belly. The Association of Writers and Writing Programs can and will satisfy your hunger to improve as a student, writer/poet, and help better develop much needed networking skills. At least fill your back pack with as many books as you can carry home! Ask me today how my AWP experience was and I will tell you “Fantastic!” I would never let the darker side of any event stop me from finding all the positive aspects of such a learning experience. It also allowed me to put faces to names of the many writing friends in my social media lists, such as Facebook. And please don’t let the dark horse of dreaded social media stop you from finding people like me in a crowd of this proportion. Hailing from Texas, transplanted to New Jersey by way of St. Louis, Elizabeth Akin Stelling is a force of nature. She is a wife, mother, chef, a writer, an activist, and insomniac. Elizabeth is managing editor of Z-composition Magazine, and has works published in vox poetica, Referential Magazine, getSpark, NJMonthly, Wild River Review, River Poets Quarterly, RePrint, Tuck Magazine, Linden Avenue Lit, Wordgathering, US1 Summer Fiction, and trade magazine- BizN4NJ. Her food poetry has been heard on CroptoCuisine Radio. She has two books coming out this summer through unbound Content and Red Dashboard Publishing, her first complete sets of poetry and fiction. I am so glad you will try it Susan. I like people, although I know many writers prefer solidarity in some ways. The books, the endless piles of books, if you are like my husband and I, can't get enough will drive you into a frenzy, so take money! I am going to a work shop he and his wife are running at Big Blue Marble, and he told me its all women! LOL He is still a handsome devil, even Parkinson's can't take that away from him! How wonderful that you sat with Hal Sirowitz at the convention! I just went to a poetry reading of his here in Philadelphia where he answered questions after two poet friends of his assisted with his reading. I was moved by his humor so different from mine, and he got a poem out of me too. Oh, yes, you encourage me to try this venue. As a retired teacher I thought I might not benefit, but I hear your experience here and agree that--especially with a book or chapbook-this would be fun and worthwhile. Thanks.